Carly Fiorina, surging in the polls thanks to her performance in the Republican presidential debate last week, is not to be underestimated or believed. Fiorina was crisp, sharp and quick in the debate -- all characteristics that helped her become Hewlett-Packard's CEO from 1999 to 2005. But she also used her opportunity before a national audience to distort her history at HP by omitting key facts. "Yes, we had to make tough choices, and in doing so, we saved 80,000 jobs, went on to grow to 160,000 jobs. 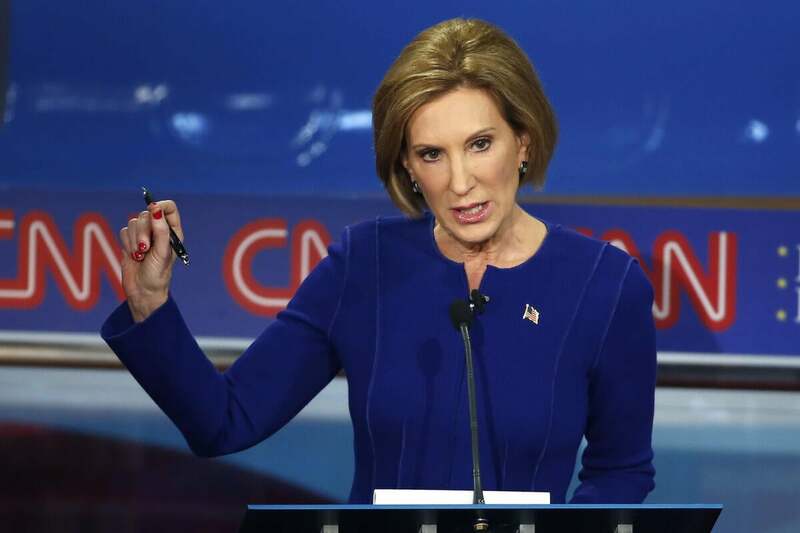 And now Hewlett Packard is almost 300,000 jobs," said Fiorina, during the debate. What Fiorina didn't note is that much of HP's employment growth was through acquisitions. In 2001, HP acquired Compaq, adding 64,000 employees, and in 2008 it added EDS, gaining another 139,000. Whether these acquisitions were wise or successfully integrated is a matter for debate. But a more important issue may be whether HP still matters as a U.S. employer. Many of these jobs are overseas, and more may be heading there. HP doesn't report its U.S. employment, and that's a critical piece of data. If HP's U.S. workforce is shrinking, while its overseas workforce expands, Fiorina may be forced to reshape how she talks about HP. One day after Fiorina told a national audience about how she helped HP create tens of thousands of jobs, Mike Nefkens, the head of HP Enterprise Services, said something different. Nefkens explained at Thursday's analyst meeting how HP is "exiting labor in high cost countries," which includes the U.S. and European nations, and shifting to lower cost regions, specifically Manila, Costa Rica, Bangalore, and Sofia, Bulgaria. By 2018, "only 40% of our workforce will remain in high cost locations," said Nefkens. It's reasonable to conclude from these remarks that the vendor's just announced layoff of up to 30,000 workers – called a "rebalancing" by HP -- may hit the U.S. workforce hard. Of the 302,000 people that HP employed in 2014, 100,000 of them are in the "Americas," which typically means North, Central and South America; 85,400 in Asia Pacific and Japan; 68,700 in Europe, Middle East and Africa, and 47,822 in certain majority owned subsidiaries without identified regions. Fiorina alluded to the layoffs that occurred during her tenure, roughly 30,000, when she mentioned tough choices. She has been criticized for those layoffs, which were the result of the Compaq acquisition and the dot.com bubble. Big mergers also bring layoffs. HP CEO Meg Whitman is already responsible for some 85,000 layoffs, when the latest announcement is added. But Fiorina's implied claim that her actions have helped HP achieve its current employment are empty. IBM has been cutting its U.S. workforce and there is no reason not to believe that HP isn't doing the same, especially after this week's analyst meeting. It remains to be seen whether Fiorina will have a frank discussion with the public about the ongoing shift of U.S. jobs to workers overseas. For now, she is painting an ideal view of HP's employment picture to boost her campaign, and not to inform the public about what's true and hard.